Water has been ranked as one of the top global risks for the past 7 years by the World Economic Forum and the UN had predicted a 40% shortage in global water supply by 2030. The increasing issues of water scarcity, water pollution, droughts and floods are becoming a serious threat to the long-term sustainability of companies’ growth and profitability in many countries –pushing investors to be on the lookout for water-related risks in their portfolios and across industries of potential interest. Sustainable access and the usage of water are both emerging as key environmental considerations. Water additionally amounts to a tangible operational and financial risk for many sectors globally. In this study, The Smart Cube has focused on understanding how the top food & beverage companies in emerging markets are dealing with water risk and identify those with high water risk. 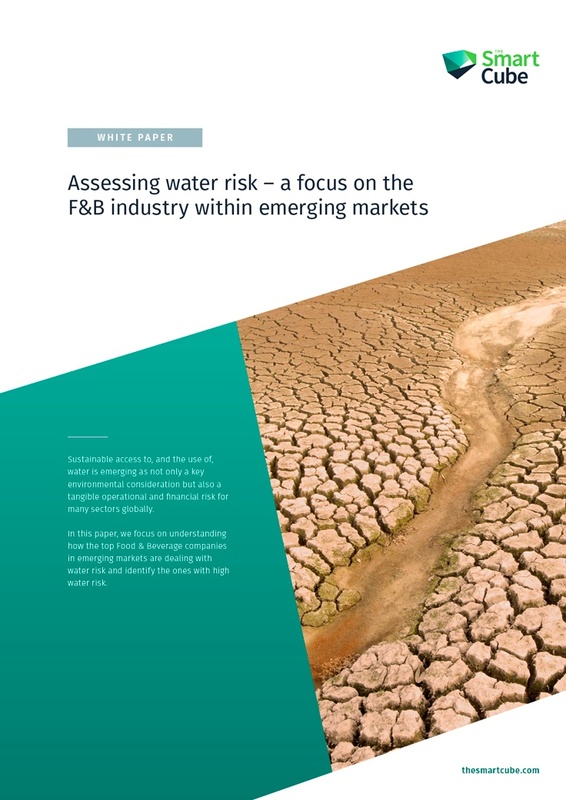 After examining the practices of the top 30 publicly listed F&B companies (by market cap) in emerging markets, one thing is clear – investors need to focus above all on a company’s risk-mitigation strategies for truly understanding its water risk.